Thanks for writing! Here at NIRVANA Central, the switch boards are buzzing, the conveyor belts are moving fast, and the crews are working double shifts towards the September 24th release date. The band, being the benevolent friends of the proleteriet that they are, just raised the coolies pay 10¢ to an even $1.50 an hour. The same price as the ALL AMERICAN MEAL at McDONALDS™. NIRVANA, in special conjunction with McDonalds™, are proud to announce the NEVERMIND HAPPY MEAL™. The only way to receive NEVERMIND is when you buy the HAPPY MEAL™. It will not be available in stores, just like another project NIRVANA has been working on, NIRVANA PLAY CHARIOTS OF FIRE AND OTHER HITS. It will only be available through a special T.V. offer. And, as an added bonus, a book called NIRVANAS CRAFT SECRETS will be offered. It will show you all of our special touches for those sea shell macrame plant hangers and spray painted macaroni paperweights and much much more. We are also doing a tour of shopping malls and county fairgrounds to promote out new record and book of craft secrets. Also in the planning is a video cassette demonstrating how to have a tranquil day at the beach collecting driftwood and sea shells, and how to make the memory last by constructing a wall hanging with what you have found. We’ll have tranquil New Age music, along with step by step instructions so you can relax while you work. Rainbow and unicorn stickers will also be included. Look for it in 92. Well thats all for now folks. See you soon. 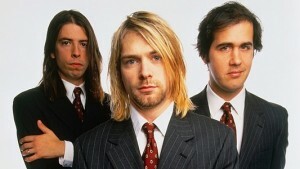 I think we can all agree that Nirvana is about as serious a band as they come. Not exactly known for being a laugh a minute type group. But here they are using humor to connect with their fans AND defining their values as a band all in one go. 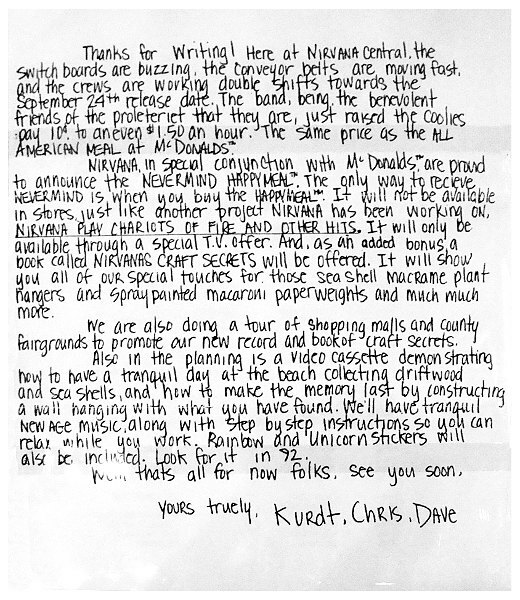 Not only could they not have a McDonald’s deal in September of 1991, they wouldn’t have even considered the idea in 1993 when they were one of the biggest bands on Earth. This letter is chock full of irony and sarcasm. What would you actually do and what’s the opposite of that? If you’re maybe a country artist with endorsements and sponsors taking up more room on the stage than your drummer, then this letter wouldn’t be funny at all. Think about your values as an artist and riff around with some opposites and exaggerations. If you’re going on a 3-city tour, call it the 120 City (Plus or Minus 117 Cities) Tour. The real lesson here is that no matter what kind of art you do, humor is a great way of connecting with your fans, humanizing yourself (by coming out of your typical artist mode), and still defining who you are as an artist. What do you think of this? How will you use some humor to further engage your audience?